Click on add to cart button lower down the page to order this book now. 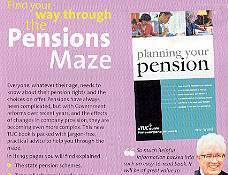 *Finding Your way through the Pension Maze? Everyone, whatever heir age, needs to know about their pension rights and the choices on offer. Pensions have always been complicated, but with Government reforms over recent years, and the effects of changes in company provision, they are becoming even more complex. This new TUC book is packed with jargon-free, practical advice to help you through the maze. Types of schemes )employer-run, salary-related, personal, stakeholder). What happens to the money. The Inland Revenue's rules: courses and conferences; useful addresses; and glossary of terms and abbreviations.